1. Set up a double boiler and keep water at a slow simmer. 2. Chop your selected chocolate to the size of peas or hazelnuts, and add to double boiler. Stir often to ensure chocolate does not burn, and continuously scrape down the sides of the bowl. 3. Once chocolate has completely melted and has a silky texture and has reached a temperature of 132 degrees, remove from heat. Wipe the bottom of the bowl with a dry towel, being careful to avoid any water dripping into the melted chocolate. 4. Pour out 2/3 of the melted chocolate onto a marble or granite surface. Using bench scrapers, spread chocolate to about 1/8 to 1/4 inch thick. Then, gather chocolate back to the center and continue to spread until chocolate reaches a temperature of 80 degrees. 5. Return cooled chocolate to bowl with remaining 1/3 melted chocolate, stirring to combine. 6. 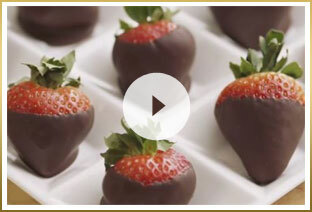 Use tempered chocolate to dip fruits and desserts, make chocolate decorations, and more.